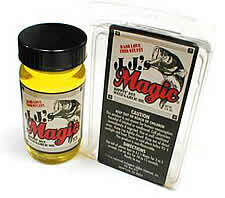 Another product I have been using for several years and really like is JJ’s Magic, a dip and dye for plastic worms. J. J. Polak is president of the Flint River Bass club and had been producing this dye for years. Last year he was a sponsor of the Bass Chapter Federation and many people at the tournament used his dip and dye. Worm dyes have been around for a long time and I have been using them since they came out. You dip the tail of a lizard or worm into the dye and it magically changes colors. The dye is a strong solvent that reacts to the plastic and changes it. JJ’s takes it one step further. There is a strong garlic scent that permeates the worm, making it more attractive to bass. JJ’s Magic comes in chartreuse, red, blue and clear for just adding scent. They work for me. You can check out his products at http://www.jjsmagic.com/ or click on the ad to the right. This entry was posted in Bass Fishing, Fishing Product Reviews on July 1, 2014 by ronniegarrison.